« Are Airline Stocks A Buy? While the Chinese stock market bubble was brewing, a lot of people ignored it and frothed at the mouth about the over-valuation in the US market. In keeping with that odd behaviour, while the US market has now fallen less than half the distance of the Chinese market (from their respective October 2007 tops), most people are more concerned about the US markets and again are ignoring the very real and brutal bear market in China. Part of the explanation is that the US markets are obviously much larger and have more significance on the world stage but still, a bear market is a bear market. And over in China they are grappling with a big one. 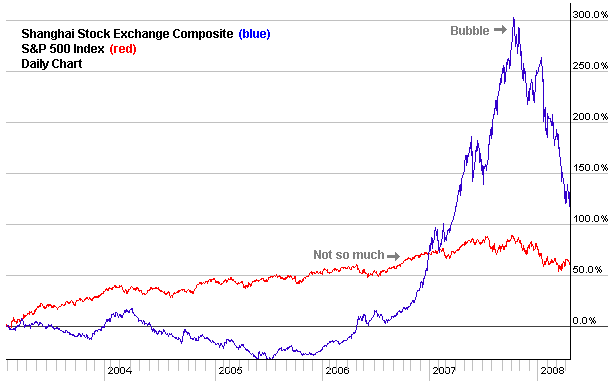 The Chinese stock market has gone through bubbles before. This time it only multiplied by a factor of 6 in less than 2 years! But tha’s nothing compared to 1991 when it multiplied by ten in about a year. Remarkably this recent mania was so strong that it shrugged off a trading stamp tax increase last summer and continued to rally for a few months. Usually such state manipulation would have meant a quick death to the mania. To the left is a graph showing the S&P 500 and the Shanghai Index since March 2003, the bottom of the last bear market. Since the bull market in Chinese shares lasted longer than most predicted, it is safe to say that the bear may last longer also. The next level of support is around the 3000 level. After that, the resistance levels from 2000-2001 will come into play at the 2000 price levels. Probably the best timer of Chinese stocks has been the editor of the newsletter, Cabot China & Emerging Markets Report. Their virtuoso performance in BRIC emerging markets brought them the trophy of the best newsletter in 2007. For the record, they turned negative in November 2007 right after the top and are continuing to stay away. The editor, Paul Goodwin, uses an extremely simple way to enter and exit the market: 50 day and 25 day moving averages of Halter USX China Index (HXC). That’s it. Trading doesn’t have to be complicated. Although there are quiet a few individual Chinese ADRs trading on US exchanges, the only way that I know to actually trade Chinese equities (the A shares) is through the Morgan Stanley A Shares Fund (CAF). It has fallen from almost $61 in October 2007 to its current price in the low $30’s. 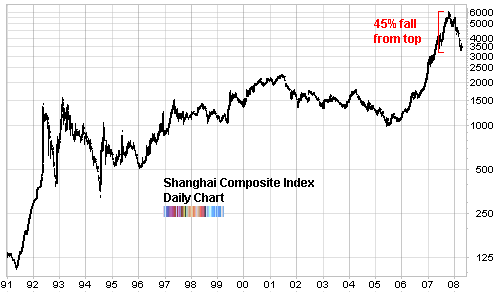 As a trading vehicle it is an imperfect one because it doesn’t track the Shanghai index very well. But unless I’m mistaken, it is the only way to get your hands on those A shares from outside China.